To be fair, I’m sure they mean well. And probably some of you will actually be interested in buying one of these. But…my mother had one of these when I was a kid in the 70s, and I simply cannot stop giggling every time I look at this, particularly the picture above. I will try valiantly to curb my amusement long enough to write this post; however, I make no promises. Because this has not just tickled my funny bone, but is tap-dancing on it. 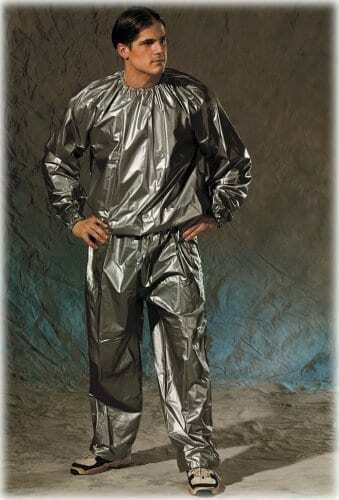 The idea here is that if you exercise in a sauna suit, you lose more weight. Very good idea in principle, since the more you sweat the more water weight you lose. Really, that’s all there is to this. The suit is made of PVC with elasticized cuffs, neck and waist. As you exercise, heat builds up inside the suit and you literally sweat the pounds away. I have to wonder…how does one clean this effectively? I hope you can toss it in the washer on the delicate cycle. Otherwise, you’re going to need several of them, because putting on a wet bathing suit has nothin’ on putting on a PVC suit you’ve sweated profusely inside of. Sorry…it’s how my mind works. Anyway. If you want one of these, they’re actually pretty cheap at $15.00 to $26.00 US depending on size. I’ll just be over here, giggling my fool head off if I see someone in one.